Alan Moore’s Watchmen is recognized in Time’s List of the 100 Best Novels in the English language published since 1923. This achievement is especially significant since Watchmen was the only graphic novel included in this list. Whilst these facts are interesting, what is Moore’s connection with music? Moore’s first paid work was with music magazine, NME. In 1983, using the pseudonym of Translucia Baboon, Moore founded his own band, The Sinister Ducks. A year later, with David J, he released a 12-inch single featuring a recording of “This Vicious Cabaret”, a song featured in V for Vendetta. We have established a link with Moore and music, but where do the two labyrinths of music and graphic novels collide? Moore did this when he wrote Swamp Thing for DC Comics by introducing John Constantine, “an English working-class magician based visually on the British musician Sting”. Moore does this again and in much more detail with The League of Extraordinary Gentleman Century: 1969, part two of the third volume of The League of Extraordinary Gentleman. 1969 was an important year for music with many significant events, including, Woodstock and the final public performance of The Beatles with Billy Preston on the roof of the headquarters of Apple Corps at 3 Savile Row. 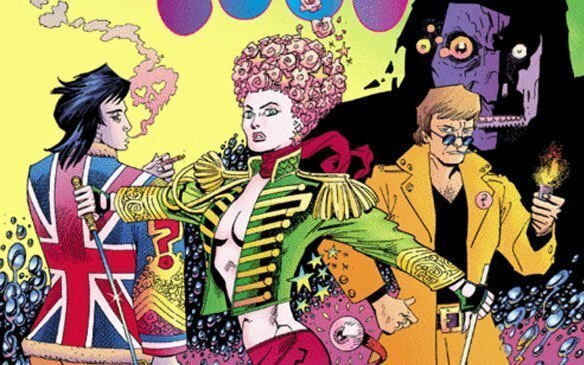 Courtesy of Knockabout Comics, XS Noize will explore The League of Extraordinary Gentleman Century: 1969 and all its glorious musical connections. The year, as suggested by the title is 1969. The setting is Sussex. Two young men are sitting naked in a swimming pool getting high. One of these young men, Baz is reminiscing over his halcyon school days at St Cuthbert’s (“Custards”) public school where he met Tim, the lead guitarist of his band: The Purple Orchestra. These two men then suddenly see three figures appear dressed up “like monks”. We then come to the next chapter titled: Paint it Black. There is talk in the papers about “the pop-star in the swimming pool”. There is uncertainty surrounding his death. How many musical links did you spot? The most obvious is the title of the chapter, “Paint it Black”, the title of the classic The Rolling Stones song. The next is the swimming pool in Sussex. Baz and his fellow naked companion are in the swimming pool in Catchfield Park, East Sussex; the same place where Brian Jones, The Rolling Stones guitarist, died in 1969. We then come across three men in a strip joint in East London (with matching accents) discussing this latest headline and are convinced that the pop-stars’ death was not accidental. One of these men, Wolfe, who was with Baz at the time did not see how Baz met his end as he was “pilled up”. Mr C and Vince are not happy with Wolfe and are determined to get to the bottom of this matter. Meanwhile, The League of Extraordinary Gentleman are touring London. The League eventually meet up with Lando who is managing a Beat Club and leads them to a “Space-Age” lair where they hang out and listen to vinyl and the news. It is announced that The Purple Orchestra is going to perform a free tribute concert in memory of their recently “deceased band member Basil Thomas…” In 1969, The Rolling Stones performed a free tribute concert that was dedicated to Brian Jones, which was actually a pre-scheduled event to present new The Rolling Stones guitarist: Mick Taylor. As well as League member Mina receiving a clue through her dreams who is potentially behind Basils’ murder, she and the rest of The League check out Berwick Street, a notorious London street that was once festooned with independent record shops which Oasis would feature on the cover of their second LP: (What’s the Story) Morning Glory? The League then spot a person wearing “creepy black monk’s robes”. This person is none other than Terner, the lead singer from The Purple Orchestra, who looks like (even if he doesn’t move like) Mick Jagger. Elsewhere in this Moore created universe, Max Foster is the US president. Foster is a pop singer and “hippy (fascist)” who is “setting up camps for anyone he thinks is too straight”. The League are convinced that similar things could happen in the UK via Terner who is a hoodwinked vessel. The League of Extraordinary Gentleman Century: 1969 concludes by stepping eight years into the future: 1977, the year punk peaked. Allan from The League is seeing none other than a punk band at Club Debasement with fellow League member Orlando (who is now female). The third and final part leaps thirty-two years later to 2009. Moore’s musical knowledge and references of 1969 are adroit. He also studies how societal norms and etiquette were in 1969. For example, the word “coloured” is not frowned upon or seen as politically incorrect. The artwork of The League listening to music on the radio and the use of the made-up lyrics of these songs blaring away is both captivating and mesmerising; an illustrative technique Si Smith would later put the use in How to Disappear Completely. The controversial and shocking lyrics a hypnotised Terner would use when on stage including “While Dachau choked and Nagasaki smoked, oh, how I joked! What fun I poked” escalate frustration and tension and further engross the reader into this “tripping” world. The use and effects of drugs is profound and the way young women are left vulnerable is addressed without censorship. The plot and the history of The League of Extraordinary Gentleman Century: 1969 is difficult to place together without reading part one. The ending does not offer complete closure unless one continues to read the third and concluding part of the third volume. Nonetheless, in part two, the music of 1969, everything surrounding it and how The League of Extraordinary Gentleman, who have travelled throughout the centuries (look out for the references to Merlin and Troy) interact with this world, to the cliffhanging ending in the 1977 world of a punk show demonstrate Moore as a writer who can bring superheroes, arch-villains and music together.